The other day I was writing about an article about how Formula 1 generate money and what part of it goes into Prize Money fund which is distributed among 10 teams equally and on merit. So the Formula 1 Prize Money is pretty well documented so I decided to dig deep and find out how does it work in MotoGP, and what I can confirm is that just like Formula 1, MotoGP riders get yearly salary contract which included bonus payments for winning races or finishing on the podium or even other performance related bonuses. But do they get anything from Dorna (motoGP parent company ?) well its kind of not documents or not much info is available about Prize Money for riders but MotoGP do offer big prize money for teams according to how they finish in the table. In June 2013 in MotoGP meeting it was decided that 3 more rider slots will be offered in 2014 and 2015 season making the total number of bikes on the grid to 24. Dorna CEO Carmelo Ezpeleta explained that MotoGP is looking to increase the number of bikes on the grid with independent teams looking to buy the slots and in the meeting he explained that if new teams comes in, current teams will get the benefits like prize money, travel allowances and tyres costs while the new teams will have to incur their own tyre cost and in 2015 season MotoGP will offer prize money to top 22 riders while riders who will finish 23 and 24 will get some benefits and riders finishing outside top 24 will not get any prize money or benefits. So to answer the questions that is there any Prize Money for the riders & teams in MotoGP ? Yes there is prize money involved and according to MotoGP.com in 2015 only riders finishing in the top 22 will get the prize money. The prize money we are talking about is on the championship level, not race to race basis. Prize money is handed out to riders and their teams at the end of the season according to the teams and riders finish. How Much is the MotoGP Prize Money ? Well thats a well guarded secret by Dorna & MotoGP. I talked to a few very knowledgable MotoGP fans who either could not answer the questions or they opted for two options. But since MotoGP itself has confirmed there is prize money the option 1 is out of the way but how much is payed out and how its distributed between the rider, team and crew member is not known. According to some sources prize money is very little and it is paid out to the teams who than distribute it among the crew members. Becuase drivers has professional contracts which include bonus payments for performance related clauses (winning races/finishing in podiums etc). There is a definitely prize money paid out to some riders in lower motoGP classes. Of course its not huge but it is enough as a reward for young riders in Moto2 and Moto3 classes to keep themselves equipped throughout the season.. 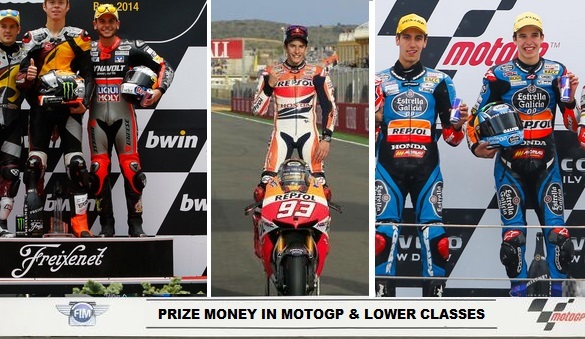 Following table shows how much prize money is paid out to riders in lower classes of MotoGP.